The Kansas City Chiefs have made both quarterback Aaron Murray and running back Knile Davis available for teams. The Chiefs are cutting their roster to 75 players this afternoon and to 53 players by Saturday. Murray was the Chiefs 2014 fifth round pick but was sandwiched between Tyler Bray, who got an extension last season, and Kevin Hogan, who was drafted a few months ago, which leaves Murray as the odd man out. A team like Dallas may be interested in Murray. One note from this morning on @gmfb: The #KCChiefs have made teams aware that QB Aaron Murray is available via trade. A low-cost option. 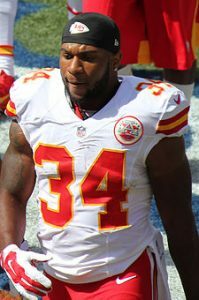 Another guy available via trade: Chiefs’ Knile Davis, who has been on the roster bubble all camp. Ty Hill as KR makes Davis expendable.